Premier League match preview. 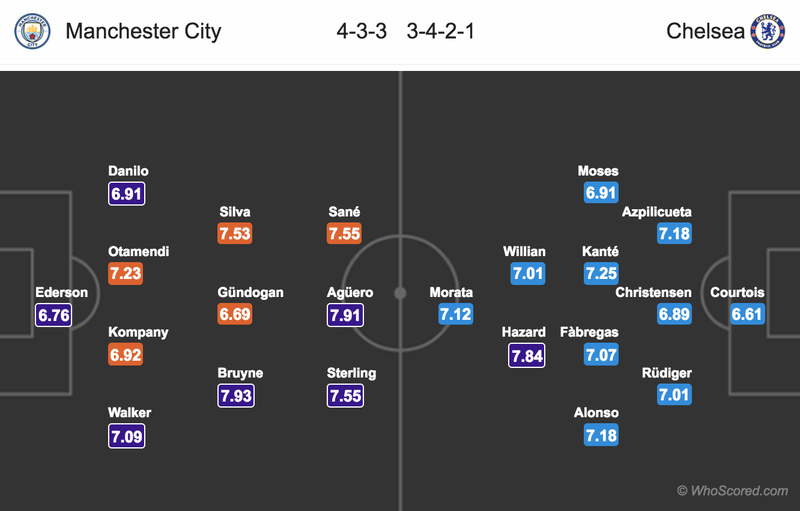 Lineups, News, Stats – Man City vs Chelsea. Referee appointment: Michael Oliver, team news, injury news. Manchester City will host Chelsea in the 30th matchweek of the English Premier League this Sunday. Fernandinho remains doubtful with an injury, he missed the Premier League game against Arsenal yesterday. Raheem Sterling likely to return to the lineup after resting out in the last game due to recent recovery from injury. Vincent Kompany and Nicolas Otamendi both have started last two games; Pep Guardiola could be giving one of them a rest, John Stones and Aymeric Laporte both could get some playing time here. Kyle Walker picked up a minor knock in the midweek, but is expected to return. Fabian Delph is still out through suspension which means Danilo and Oleksandr Zinchenko will be fighting for the starting berth at the full-back role. Chelsea boss Antonio Conte remains without trio David Luiz, Ross Barkley and Tiemoué Bakayoko. Gary Cahill and Antonio Rudiger both will be fighting for a spot at the heart of defense. Manchester City have won 23 of their last 26 games in Premier League. Manchester City have scored more than a goal in their last 13 home games in Premier League. Three red cards have been drawn in their last three meetings at the Etihad Stadium in Premier League. Chelsea have lost 3 of their last 4 games in Premier League. Manchester City 2 – 2 Chelsea, the visitors are not in their top form but they are likely to fight to atleast get a point away from home.